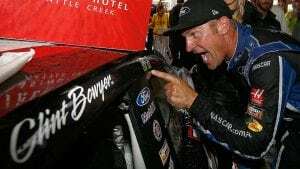 BROOKLYN, Mich. – Clint Bowyer gambled. Then he made sure he cashed the winning ticket with a determined charge on two new tires as rain threatened Michigan International Speedway. Bowyer got the lead under caution at the end of Stage 2 of Sunday’s FireKeepers Casino 400 when crew chief Mike Bugarewicz opted for two tires on the No. 14 Stewart-Haas Racing Ford. Bowyer had to do the rest, holding off teammate Kevin Harvick after a restart on Lap 126, barely preventing Harvick, who had fresh rubber on all four corners of the car, from clearing him off Turn 2. Bowyer got the good fortune he needed when Ricky Stenhouse Jr. spun in Turn 2 on Lap 129, causing the eighth caution of the afternoon. Rain started almost immediately and soaked the track, forcing NASCAR to call the race after 133 of a scheduled 200 laps at the 2-mile track. That made Bowyer the winner of a Monster Energy NASCAR Cup Series race for the first time at Michigan and the second time this year. With pole winner Kurt Busch finishing third behind Bowyer and Harvick, Stewart-Haas pulled off its first 1-2-3 sweep in the organization’s history. Harvick was close indeed. He was roughly one foot away from clearing Bowyer off Turn 2 on the restart and picking up his sixth victory of the season. “The 14 just gambled, rolled the dice that the rain must have been going to come, and he was able to keep me on the bottom there just by a little bit on the restart,” Harvick said. “Then it was just going to take me a few laps to work back by. Kyle Busch ran fourth in the No. 18 Joe Gibbs Racing Toyota, the only non-Ford driver in the top eight. Paul Menard came home fifth, his best finish of the season in the No. 21 Wood Brothers Ford. Brad Keselowski, Joey Logano, Ryan Blaney, Chase Elliott and Jamie McMurray completed the top 10. The start of the race was delayed 2 1/2 hours by rain, and it ended when the rain returned, but the afternoon belonged to Bowyer, who was well aware of just how close his teammate came to depriving him of his 10th career victory. “He almost cleared me off of (Turn) 2, and he would have rode off into the sunset again for the 4 car,” Bowyer said of Harvick. “I was able to just get by him, because he left me room and was courteous and a good teammate. Kyle Larson’s hopes for a fourth straight Michigan victory were hampered by a Lap 85 spin off Turn 4. Larson’s Chip Ganassi Racing No. 42 Chevrolet skidded into the infield grass, damaging the front splitter. Larson limped home with a 28th-place result, ending a personal string of four straight top-10 finishes. Three Joe Gibbs Racing drivers — Kyle Busch, Erik Jones and Denny Hamlin — started at the rear of the field after issues with their cars’ splitters in pre-race inspection. All three rallied to race into the top 10, though Jones dealt with further adversity with a speeding penalty on his first pit stop. The Monster Energy Series takes next weekend off, returning to action for the Toyota/Save Mart 350 on June 24 (3 p.m. ET, FS1, PRN, SiriusXM) at Sonoma Raceway.